Let the countdown 'til Christmas continue with DAY 23! Santa is coming in just a couple days. Are you prepared? Your biggest concern - the milk & cookies. Botch this up and your holiday could be ruined. What if you don't offer him enough? The jolly man likes to eat. Play it safe. Don't leave Santa a plate of cookies, leave him an entire jar of cookies. 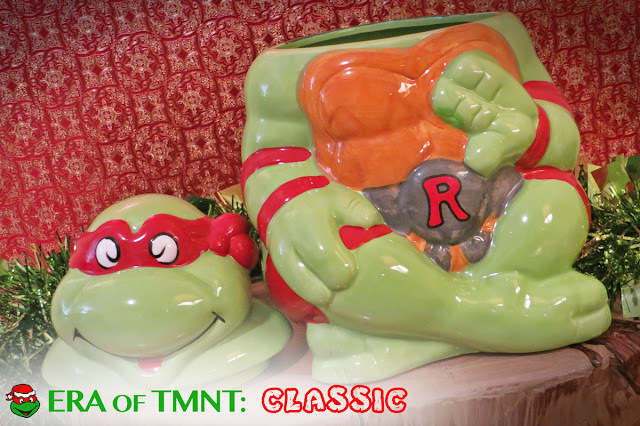 The TMNT cookie jar will hold enough treats for even the biggest sweet tooth. It's well over a foot in height. That offers more space than the Technodrome! The cutesy design is lifted from the classic cartoon with a copyright of 1990. 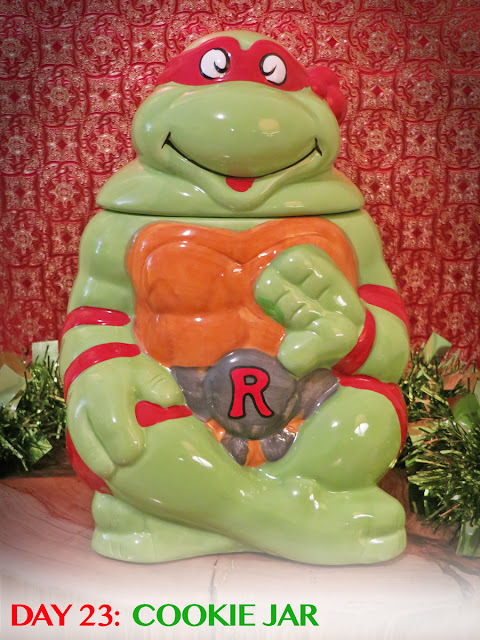 Cookie jars were made with the likeness of each Turtle, but I opted for only Raphael. No one can eat 4 jars of cookies - not even Santa. Does the cookie jar make s good gift? I've never met a person who didn't like cookies. I assume there's a flavor out there for everybody. 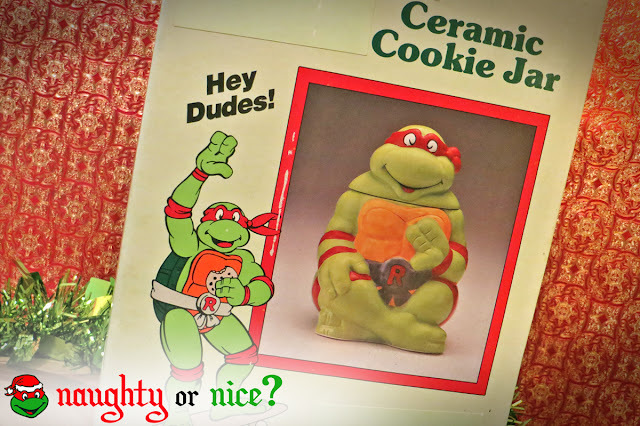 So who wouldn't love a TMNT cookie jar? It's utilitarian, stylish & fun - attributes that anyone, of any age, can appreciate. Jam the jar filled with cookies this Christmas. Santa will stuff his gut with Turtle Power and feel obligated to leave you more toys. And more toys are always good. My life credo. 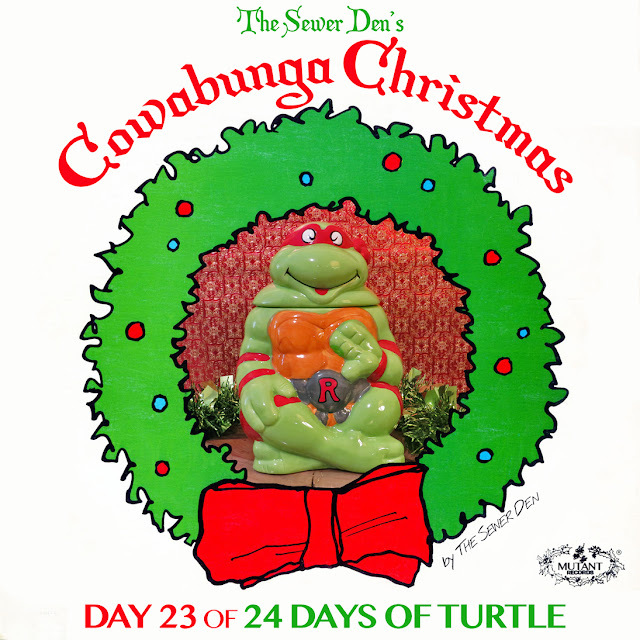 Check back tomorrow for DAY 24, the final day of Cowabunga Christmas! Can't wait until then? Take a trip with the Ghost from Christmas Past to see what The Sewer Den put on display on December 23rd in 2013 and 2014.